**Please note that because the AGO doesn’t open on Saturdays until 11 am, entrance to the theatre in the morning will be only via McCaul St. (just around and behind the Moore sculpture) at the corner of Dundas and McCaul. Our program remains the same. What has changed, as a result of having to secure a new venue for 170 people (and counting) at the last moment, is that I can no longer afford to feed your multitude. So, with great regret, I have to say that there will be no lunch, no reception or cash bar, and no coffee service. **Please keep in mind that only water is allowed into the theatre. **Please print your ticket and bring it along. We’ve got to monitor numbers because theatre regulations do not allow for people to stand. Writing thru "Race" took place in Vancouver in 1994. Far from being a local event, it shook up the nation. Sponsored by The Writers' Union of Canada and organized by a large coalition of First Nations writers and writers of colour, it proved to be a milestone event in "race" politics and cultural production, government- and media-driven controversy, and community building. Its repercussions have been felt in Canadian writing and publishing, government, cultural and arts organizing, activist labour, and critical theory. 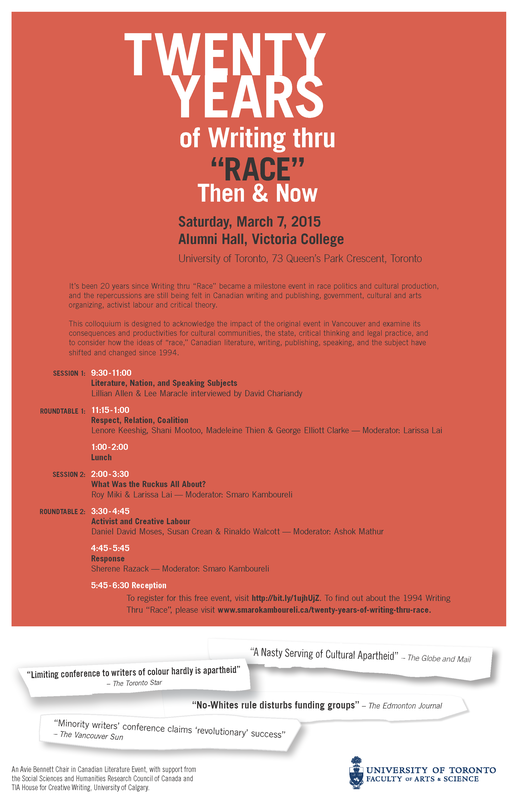 Twenty Years of Writing thru "Race": Then and Now is a colloquium designed to acknowledge the continuous impact of the original event and examine its consequences and productivities for cultural communities, the state, critical thinking and legal practice, and to consider how the ideas of "race," Canadian literature, writing, publishing, speaking, and the subject have shifted and changed since the original 1994 event.